Our Cold Appetizers, include options for deviled eggs, salami horns, meat trays and more! We have a variety of traditional and modern hot appetizers for your event including wings, crab cakes shrimp and calamari. We serve dinners in a variety of fashions. One of the most popular are station services, with a variety of dishes including , carving stations, crostini station and mashed potatoes. Our famous paella station is always a hit with options for traditional/authentic/italian or kielbasa. Get ideas for your dinner entree’s including baked stuffed shrimp, chicken pomodoro, filet mignon and more! 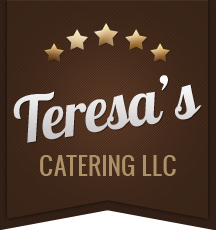 Teresa’s family style dinner includes options for delicious salads, soups and sandwiches, and family favorites like lasagna and pork tenderloin! Teresa’s buffet style dinner showcases our famous ham, italian meatballs, rice pilaf and roast pork!